It's summertime, and the Bumpus family is growing! Aunt Rosie and Uncle Jonathan are expecting, and the entire family gathers together at Whispering Pines for a baby shower. But with Willow's injured hand and big sisters pushing their way into the kitchen, it looks like Delia and Willow might have to surrender their aprons. After Grandma gives each of the grandchildren a family heirloom, Delia's goes missing. Could it be lost in the cupcake's batter? Follow the tasty recipes once again as Delia and Willow solve the mystery of the missing keepsake and celebrate the arrival of even more cousins in the second book in this charming series. "[D]ebut novelist Hannigan has assembled all the ingredients for an entertaining and gentle-natured family tale. 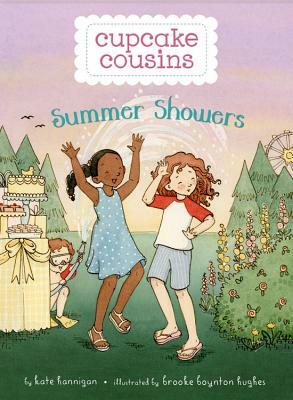 Delia's anxieties and Willow's struggle to be seen as more than a little kid are relatable, and first-time illustrator Hughes's spot illustrations?give a good sense of the girls, the vacation home they love, and the matter-of-fact racial diversity of their clan." Kate Hannigan loves to test new recipes on her husband, three kids, and even the family dog. When she's not creating disasters in her Chicago kitchen, she's usually at her desk writing fiction and non-fiction for young readers. Kate is also the author of Cupcake Cousins, Cupcake Cousins: Winter Wonders, and The Detective's Assistant. Say hello online at katehannigan.com. Brooke Boynton Hughes grew up in Loveland, Colorado, where she spent lots of time drawing cats, mermaids, and tree houses. Today, she lives in Washington and holds a BFA in Printmaking from Colorado State University and an MFA in Figurative Art from the New York Academy of Art. Brooke is also the illustrator of Cupcake Cousins, Cupcake Cousins: Winter Wonders, Baby Love, and Henry Wants More! Visit her online at brookeboyntonhughes.com!